Ahoy there me mateys! I received this sci-fi eARC from NetGalley in exchange for an honest review. So here be me honest musings . . .
Well ye landlubbers, this is how the mermaids of the deep truly be. Not some beautiful singing maiden longing to be on land but menacing fierce fighting and killin’ machines that will rip yer face off and guzzle yer flesh. Arrrrr! Nasty creatures they be. Much thanks to Mira Grant fer giving up a better understanding of the denizens of the deep sea. Mehaps it just be me but this took awhile to be engaging. Now don’t get me wrong, I liked the science of it right fine. I enjoyed the characters in it. It just took too much time to get into the nitty-gritty of the beasts and action. I didn’t get hooked onto the story until 63% and it only really gripped me until 85%. Plus I did not really enjoy the ending. But me mateys were chatterin’ in excitement about this one and plus I adore the author’s other work so I was determined to finish this. I am glad I did. I loved the reality behind the mermaid myths. I loved the biology of the mermaids. I thought the killin’ be awesome though I don’t fancy fighting one of these beasties meself anytime soon. Many of the ideas in this novel float me boat. Sadly the execution just didn’t thrill me. Side note: And with that I be finished with the last of the 2017 Netgalley eArcs! Arrrr! Onto the 2018 bunch! 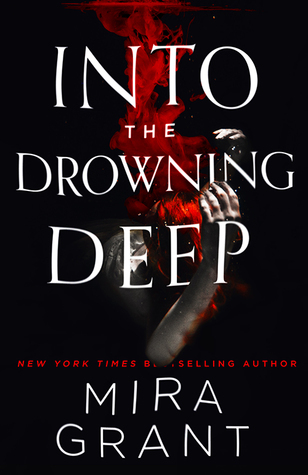 This is a read that I still enjoy thinking about because of the killer mermaids. It was a fun, engaging read. Just not perfect. But I don’t care! Thanks for visiting! Yea yo, love the quotes. They’re like testimonies. And love your review too, especially the beginning paragraph. Now I want to read this book too. I hope ye love it! Love the quotes you included here! And it’s good to know it took a while to become fully engaging, but this does sound interesting. Great post! Ye going to take a gander at these?